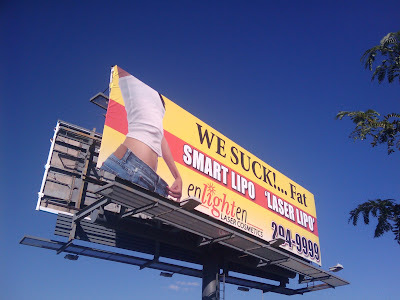 Salt Lake City's freeways are liberally adorned with billboards to try to distract eyes from the road at all times. Ok, fair enough. But in recent years the percentage of them devoted to liposuction and other plastic surgery has grown rapidly. Now it seems to be something like a quarter or a third of them.Maybe they're just the most annoying to me and therefore the ones I most often notice. In any case, this is my least favorite of all:It's totally unattractive, from the lame verbiage to the ugly photo and hideous "graphic design," it's the supreme loser, all right.And here I am making more people look at it! Sorry.